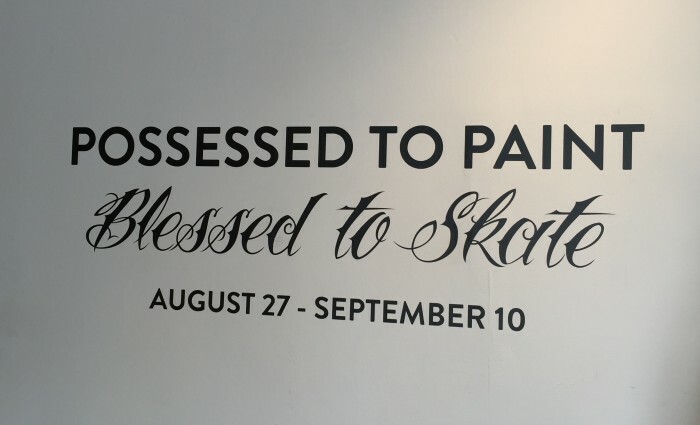 “POSSESSED TO PAINT, BLESSED TO SKATE” S.T. Tattoo Studio’s 2nd Annual Charity Art Show took place Saturday, August 27th – September 10, 2016 at the Folding Table Gallery (201 San Juan Ave, Venice, CA 90291) to benefit The Teen Project charity. Jason Brown of S.T. Tattoo Studio in Venice, CA organized this charity art show of hand-painted skateboards from some of the top tattoo and skate and graffiti artists in the nation. Here is a video interview with Jason Brown by Jeff Ho and a look at some of the artwork. If you are interested in purchasing any of the artwork for a good cause, please contact: Jason Brown, S.T. Tattoo Studios (310) 390-6722, jasonbrown@sttattoo.com. Nationally renowned skaters, tattoo artists and rockers contributed their work to help raise funds for homeless teens in LA. Good people doing good work. Contributing artists included: Jason Brown, Donovan Faulkner, Gabriel Quintana, Axis, Bart Saric, Belladonna Dalyon, Big 5, Big Gus, Big Sleeps, Billy Parker, Bob Tyrell, Bryan Ramirez, Buck Ramirez, Dan Smith, Dave Sanchez, Edwin Marin, Eric DiCicco, Frankie Lamonea, Freddy Negrete, Gary Graves, Huero Espinoza, Jarret DeMartino, Jason Storres, Jeff Ho, Jesse Varela, Jimbo Phillips, John Hernandez, Jon Rosenberg, Johnny Quintana, Jojo Ackermann, Jon Lewis, Jonas Never, Josh Duffy, Lindsay Dorman, Lucky, Mando Espinoza, Mario Daggett, Mario G, Mark Islas, Marshall Bennett, Melany Dierks, Michael Castillo, Mike Espinoza, Mikey O’Neal, Nathan Charles, Nemo, Opyem, OZ, Pablo Cosio, Paul Shugerman, Robert Atkinson, Robert Corso, Rock Espinoza, Ryan Needles, Ry-Tang, Sam H, Sel, Shana Torres, Sigh, Skip Engblom, Smiley Filthy Rich, Timothy Boor, Tony Olvera, Quik and Xpres. The auction featured celebrity guests along with a sponsored bar, culinary bites from Venice restaurants, entertainment and a special guest DJ, rare skate and tattoo collectables and the art exhibit. Chloe Webb, from TV’s Shameless series and the original Sid & Nancy movie, graciously served as the MC for the night. The Teen Project provides teens aging out of the foster care system and at risk homeless youth with all of the resources and support of an intact family to allow the greatest opportunity for a successful transition to adulthood. For more information about The Teen Project, visit www.theteenproject.com. Thanks to sponsors: S.T. Tattoo, Starr Rum, Coldcock Whiskey, Marina Graphic Center, NRC78, Westside Organic Delivery, Dogtown Skates, Rip City, Sullen Clothing, Pinches Tacos and Pabst Blue Ribbon.